We’re heading into our final week of regular season games. Thankfully we’ve lucked out this year with some pretty great weather which resulted needing very few make-up games. I’m happy to say that I’m only missing the results for the following five games. Please get these to me ASAP! For those of you with games left this week, please make sure that they are reported immediately. Final scores are due by the end of the last game on Wednesday, August 9th. Games that are not reported by this time will be disregarded and may affect your final ranking. 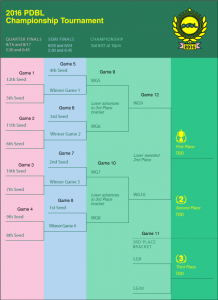 Once completely updated these rankings, calculated by your win / loss percentage, will determine your seed in the tournament. The top 4 seeded teams automatically move on to the semi-final round while the bottom 8 teams will have to compete one more time in order to move on (scheduled to begin Tuesday, August 15). This is a single elimenation tournament so once you lose, you’re out! The Final round will take place on Saturday, August 26 starting at 12pm. 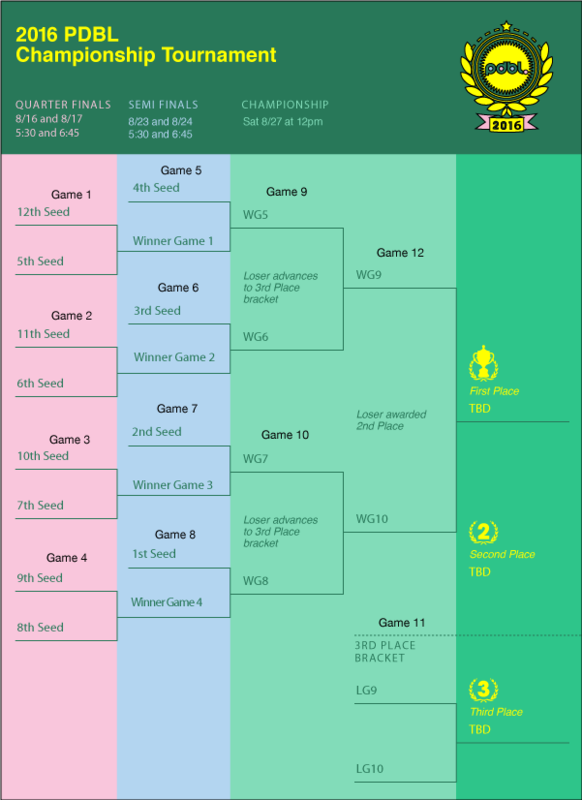 Please see the below bracket for more information on how this will take place. Best of luck to everyone! Let me know if you have any questions going into the semi-final round.